I adore this series and I simply adore the town of Whynot, where not even CNN has the power to beat the speed of town gossip, where everyone knows everyone’s nooks and crannies and the town are a family, if one is down, they all are. This is a town that comes together in times of crisis, everyone has each other’s backs and there is simply just nothing to dislike. Juliette Poe really captures the essence of small town living and love revisiting these people time and time again. This book is the turn of Colt Mancinkus, he is a farmer by trade, trying to bring the family’s farm back from the brink and is also bartender at Chesty’s by night. Colt is simply ADORABLE, there was nothing I didn’t like about him and although he wasn’t looking for love, it seems love found him, blindsided him and had him with a cheesy grin from ear to ear. Darby Culhane is new to Whynot and has come in to run the farm for her ex-brother-in-law who is more like a brother to her. 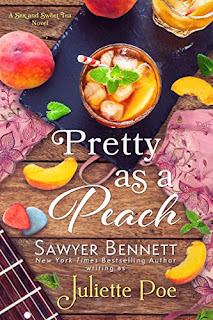 Darby is the peach princess and her idea of a new peach farm is going from strength to strength. Darby is escaping a manipulative and possessive husband and with a seven-year-old daughter in tow —who doesn’t want to relocate— she definitely has her work cut out for her. It was definitely appreciation at first sight with these two and while they try to take it slowly, in such a short book, you knew it wouldn’t be long before they succumbed. As I said above, I love the setting, I love this town and all it’s crazy, gossiping inhabitants and with each book I find myself falling a little deeper. Juliette Poe has also set up the next book in the series with Larkin and Locke and I CANNOT wait to read that one, what would a man in bike leathers want in the little town of Whynot?